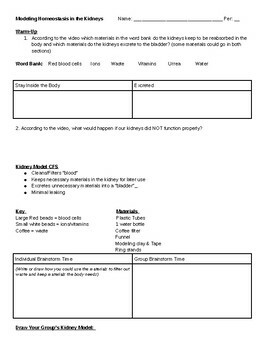 In this activity, students watch a short introductory video about kidney function (your choice) and then dive into creating hands on model that will filter "blood". For my classes, I used a mixture of water, red food dye, coffee grounds, red beads, and white beads as "blood". After creating their model in groups, the teacher tests the model by pouring one cup of t he "blood" mixture into the top. 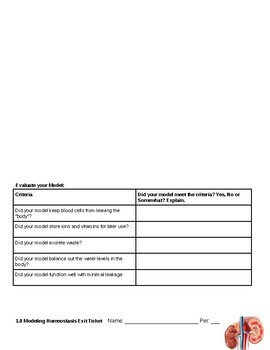 Students note whether the "blood" mixture was properly filtered and reflect on the success of their model.